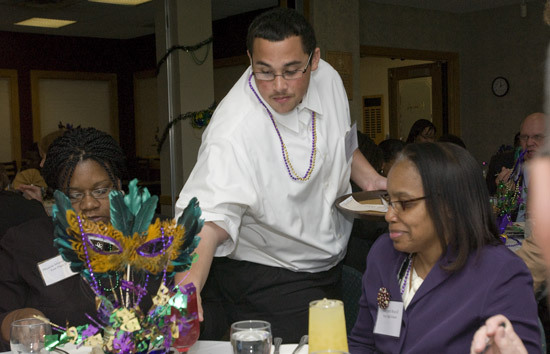 Cordero Rivera, a member of the East High School Academy of Hospitality and Tourism serves the first of four courses at the recent Mardi Gras at Henry’s Restaurant. Students planned, cooked and served the meal for 50 participants from East High School, the Rochester City School District and RIT. Putting on a dinner party or hosting a luncheon for 50 is a well-coordinated effort, from planning to execution. For the students of the East High School Academy of Hospitality and Tourism, their inaugural luncheon at Henry’s Restaurant at RIT had all the ingredients. They came together to make an occasion as delicious as the chicken etoufee and red velvet cake that was served. The Academy of Hospitality and Tourism is one of several sections within the local high school that emphasizes professional skills training and hands-on experience. The affiliation between RIT and East High School is part of the larger organization, the National Academy Foundation, established to ensure that high school students have mentoring, guidance and training toward viable careers. “It’s an honor to be here,” says Robbie Gissendanner, a junior at East. He welcomed the group then went to work as part of the wait staff. His peers managed the double doors of Henry’s into and out of the kitchen with only one close call as the salads were being served. According to Jeff Christiano, chef and faculty member at East, the May 19 program was the culmination of several months planning to present Mardi Gras at Henry’s. It also served as a final exam for the 15 students who planned, cooked, served and hosted the four-course meal. “You weren’t just guests, you were proctors. This was their final exam. How did they do?” he asked the crowd. The gathering of students, faculty and staff from both RIT and East High School applauded between bites of country shrimp and clam boil, fried green tomatoes and pecan-crusted red snapper. A new Academy of Information Technology relationship was established between RIT and East High School announced that day by Rhonda Neal. A representative from the Rochester City School District, Neal oversees the National Academy Foundation partnerships between local high schools, universities and businesses. Viet Nguyen is a second-year new media student at RIT. He began his career with the East High School Academy of Information Technology program, and started his own web-based company while in high school. “We worked out of a friend’s bedroom at first, now we have offices downtown with a staff,” Nguyen says, and went on to describe challenges he faced in high school, from disinterest in some classes to financial hurdles. With the guidance of Susan Gross, director of the East Academy of Information Technology, he navigated his high school studies. She also kept an encouraging eye on his class work and gave advice as he developed his new company.